You might be asking why we're bothering to do a Roland Garros men's draw breakdown. We all know there's a favorite, Rafael Nadal, what else is there to say? 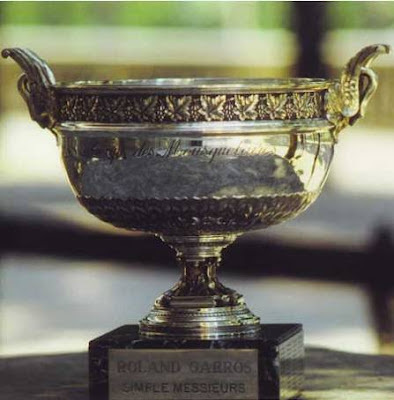 Well Nadal has certainly earned that mantle with his six titles in the last seven years, but it's far from a foregone conclusion that the Man from Mallorca will hoist the Coupe des Mousquetaires in two weeks time. That's why we watch sports. Let's be honest, who would have predicted the Brian Baker story (first ATP event since 2005 and reached the finals, for the uninitiated) even a week ago? Hell, who even remembered the guy's name before he won the USTA's reciprocal wildcard. No one. Among "others," there's of course, Novak Djokovic, the winner of the last three major finals (all against Nadal) going for four majors in a row, the "Nole Slam," a feat accomplished by neither Nadal nor Roger Federer. Federer is still not retired, in case you were wondering. You know he's 30 right? You also know he's still clearly no worse than the 3rd best player in the world and certainly knows how to win a major. But picking the champ is not the only reason for the Bracket Breakdown. We also point out the most interesting first rounders (Grounds Pass Specials), dark horses and (projected) matchups you should be watching throughout the tournament, that at least stateside is better known as the French Open. Want to know how this year's tournament will play out? Read on. The running joke is that Italian men are victims of a nefarious conspiracy with Novak Djokovic, the top seed drawing Potito Starace in the first round. 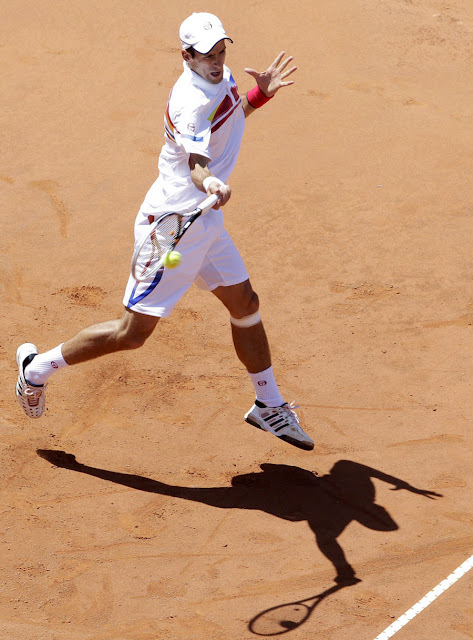 (Starace's countryman Simone Bolelli drew Rafael Nadal in his first rounder.) We expect both to be rather quickly back on flights into Da Vinci. Djokovic's second rounder should be the now seemingly ritual noble defeat of former World no. 1 Lleyton Hewitt. Never at his best on clay and off the court since early February with injury, we still expect the Aussie battler to play Djokovic tough as he did in their Australian Open encounter earlier this year. That said, we expect Hewitt to ultimately capitulate without causing too much worry to Nole fans. The Serb's first real test is seeded to be slumping Austrian Jurgen Melzer (seeded 30th) in the third round, but Melzer hasn't strung together two match wins since edging Milos Raonic for the Memphis title in February. Translation: Melzer probably won't make this date. Djokovic isn't likely to be truly tested until the Round of 16 where he will either face 22nd seeded Italian Andreas Seppi, Nice Open semifinalist Nikolay Davydenko (Seppi's first round opponent), or 14th seeded blue clay dragonslayer Fernando Verdasco. We expect a Verdasco/Djokovic Round of 16. Fun fact: Verdasco won both of their last two meetings and both were on red clay. Fifth seeded Jo-Wilfried Tsonga may not like the odds of a Frenchman to win Roland Garros, but he and 11th seeded compatriot Gilles Simon are seeded to get through this section of the draw. Tsonga opens versus Russian Andrey Kuznetsov and then is likely to face heralded German Cedrik-Marcel Stebe in the second round. The winner of the potential first round barnburner between slumping Serb Viktor Troicki and longtime next big thing Thomaz Bellucci is looking to be the third round opponent, and first potential stumbling block, for Tsonga. The top half of this section is name heavy, housing not only Simon, but "the other Swiss" Stanislas Wawrinka who always seems equally capable of either delivering or falling victim to an upset. Cinderella man Brian Baker also resides here. In an interesting twist, Baker plays Xavier Malisse in the first round, the man who beat Baker the last time the American played in a Grand Slam event and was ranked inside the top 200...the 2005 US Open. American Ryan Harrison is here as well. He has a tough opener versus the Frenchman Simon, but if he wins it, his path to a meeting with Tsonga could go through Baker (or Malisse) and Wawrinka. In other words, the path would not get any easier for the fiery American. Here lies Roger Federer and nope, he's still not dead yet. More than that, at least in his first few rounds, there shouldn't be much that troubles the 2009 champion. Federer commences his presumed march through the draw versus Germany's Tobias Kamke. David Nalbandian, Federer's likely second opponent, is not a player who we take lightly. Ranked 40th, he was only a precious few positions from being seeded and he has beaten Federer eight times. That said, five of those wins came before 2004 (or become Federer became Federer), the Swiss is 11-3 since then and none of Nalbandian's wins have come a) since 2007 or b) outdoors. Andy Roddick is the 26th seed, and should be Federer's third round opponent, but the former World No. 1 has been inactive since Miami and generally has fared poorly on clay throughout his career. If Roddick gets to the third round, we would expect his misery against Federer to continue and for the American to be on the next Eurostar to London for his real target: Wimbledon. Feliciano Lopez, the 15th seed, is seeded to be Federer's Round of 16 opponent. To make his date with the Swiss great, he'll have to get past crafty home favorite Florent Serra in the first round, likely Lukasz Kubot next and then the winner of the first rounder between 23rd seed Radek Stepanek and Belgian up-and-comer David Goffin. Well, unless Alex Bogomolov Jr. recovers his 2011 form in Paris, in which case he'll not only get past 34 year old Arnaud Clement, but the Stepanek/Goffin winner as well. Not likely, but certainly possible. Our guess is this section holds up: Federer/Feli in the Round of 16. The bottom half of this section is perhaps the most atypical clay court draw you can imagine as it is chock full of big hitters: Tomas Berdych headlines as the 7th seed, while 9th seed Juan Martin Del Potro looms in the opposite half. In between, seeds Kevin Anderson and Marin Cilic. The big Czech, Berdych, who has been on fire of late on clay, starts with Israeli Dudi Sela. Assuming he passes that test, Berdych's next opponent will be the winner of the potentially entertaining encounter between Guillermo Garcia-Lopez and Michael Llodra before facing big serving Kevin Anderson in round three. Del Potro opens against Spaniard Albert Montanes before taking on the winner of Frenchman Edouard Roger-Vasselin and "Maplesicle" Canada's Vasek Pospisil. 2003 champion Juan Carlos Ferrero is in the Del Potro section as well. He would be the Argentine's third round opponent, if he can get past the erratic Cilic in the 2nd. We expect all of these matches to be a prelude to the big one though: Berdych versus Del Potro in the Round of 16, our condolences to any ballkid/linesperson who gets hit by an errant shot in that one because those guys wail on a tennis ball like you wouldn't believe from the TV. This is the quarter of "if." The top seed here is Andy Murray, and with all due respect to what the Scot has accomplished, if there's a vulnerable member of the ATP Big Four in this tournament, at this moment, it's Murray. Given the fact that the other side of this section is headlined by David Ferrer, there's likely to be a lot to talk about here. Murray, for his part, should commence his Roland Garros without incident. His opening round opponent, Japan's Tatsuma Ito is a 24 year old without an ATP biography, despite his Top 70 ranking (ahem, paging ATP Communications) who has won less prize money in his career than Murray would for getting back to the semifinals...now watch Ito pull the upset just to teach me a lesson.... Anyway, after facing the winner of the veterans' special between Jarkko Nieminen/Igor Andreev in the 2nd round, Murray is seeded to face Aussie F1 driv--err, rising tennis star Bernard Tomic in the third round. That said, both of those third round participants are questionable, as Murray has struggled with a back injury this clay season and Tomic has struggled presumably with expectation. Making Tomic's cause even more difficult is his likely second rounder against a Colombian, either Santiago Giraldo or Alejandro Falla, who both know a little something about clay and drew each other in the first round. Giving Murray the benefit of the doubt, his Round of 16 opponent would be either the unpredictable 16 seed Alexandr Dolgopolov, the unpredictable 17 seed Frenchman Richard Gasquet or the winner of the Great Expectations Bowl, the first round matchup between the wunderkinds with growing pains Grigor Dimitrov and Donald Young. We like Gasquet (who does seem to be slowly amassing some momentum) to make the fourth round date against Murray, but man, there are a lot of "ifs." We all know how good that guy up top is on this court; still there's a chance he doesn't win this thing. 45-1, six titles, that's all resume stuff. There have been enough stories from the press about how Nadal has this thing sewn up that you almost think someone in Belgrade or Basel is executing a jinx campaign on the King of Clay. All that's not necessary, Nadal still has to get through seven matches to win this tournament again. If nothing else, the law of averages will catch up at some point, right? Nadal opens against Simone Bolelli (whose only tour level win this year was against 35 year old Frantisek Cermak--who hasn't played tour level singles in over two years), then gets the winner of Igor Kunitsyn (1-3 on clay this year) and Denis Istomin (1-6 on clay this year). After that, it's likely German Florian Mayer (1-1 against Nadal) or struggling Ivo Karlovic (1-5 since February in tour level matches). The Round of 16 is likely to serve up the first real potential stumbling block for Nadal in the form of either the rising Canadian 19th seed Milos Raonic (who reached the semifinals in Barcelona and has played well this Euro-clay season) or Argentine 13th (!) seed Juan Monaco who does his best work on the red clay and has never faced Nadal. The biggest issue here is that after what could be a rather easy first few rounds, Nadal may have to raise his game rather quickly for his Round of 16 challenge...or that Raonic can serve anybody off the court on the right day. The top section of the quarter looks likely to play to form as well with 8th seeded Janko Tipsarevic and 12th seeded Nicolas Almagro, who won this week in Dusseldorf (World Team Cup) and Nice respectively, reaching the Round of 16. You can never count completely against Philipp Kohlschreiber, Sam Querrey, Juan Ignacio Chela or Dmitry Tursunov pulling an upset; but the battle for the slot in the quarterfinal should come down to Tipsarevic and Almagro. At that point, it's all about who's best at managing expectations. And suddenly, here we are again at the final stages of a major, just like we have been for the last few years, with Djokovic, Federer and Nadal at the end of the tournament. If you're picking someone other than these three to win the title. Good luck to you and/or your son, who must be the guy you're picking over one of the Big Three. A tournament that all of my life has seemed to throw up surprise champions, is now, like the rest of the tour, the province of three men on missions. Djokovic's mission is to set himself apart by becoming only the eighth man to win a Career Grand Slam, but also winning four majors in a row, "the Nole Slam," something neither of his rivals has ever accomplished. Nadal's mission is to defend his "home turf," winning this tournament will effectively terminate the debate of the greatest clay courter of all time. 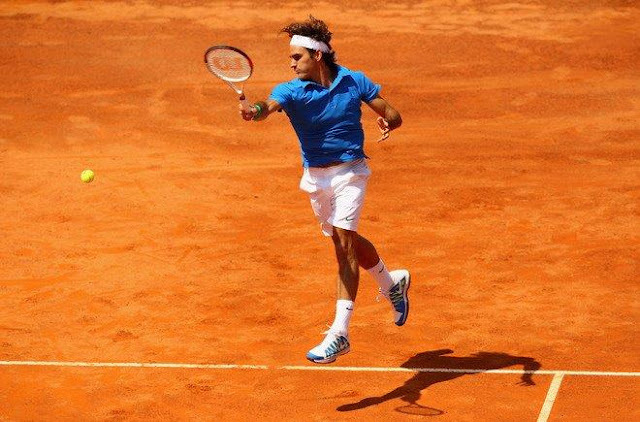 Adding a seventh Roland Garros title, to six Rome Masters, seven Barcelona titles and eight Monte Carlo Masters is in essence, the equivalent of Pascal Maria proclaiming "Game, Set and Match" on the conversation of the Greatest of All Time (GOAT): Clay Division. For Federer, it's about further shoring up his already impeccable bonafides. A win in Paris would align him with Rod Laver as the only men to have won each major twice, not to mention Federer could mathematically (if Djokovic loses early and Federer wins the tournament) return to No. 1 if he claims his second Coupe des Mousquetaires. Tennis tournaments aren't played on paper, or in pixels, but with flesh and blood competitors, 128 of them. Each prone to having career days and days when they can't keep the ball in the court. That's what makes the run of these three players (and to a lesser extent, Andy Murray) over the last few years, so incredibly special and frankly underappreciated. Tournament previews on the other hand, look at the prevailing winds, the big picture and read what tea leaves we can. I know why virtually every prognosticator picked Nadal coming into this tournament. He may not have played his absolute lethal best on the clay all year, but he has won, even against the man who tormented him last year. I can't help but agree. Nadal will gnaw on the trophy once more, Djokovic second favorite, Federer third, Federer said it himself. But again, tennis tournaments aren't played on paper. As Nadal has often said "We will see what is going on when we play the matches, no?" Great write-up Vito. Thoroughly entertaining! Vive Black Label! As soon as you decide whether or not you will want quartz observe or even a physical gucci replica and also the sort of issues you need that to own, it really is moment to consider several components. Can the particular observe winder gets the market common Programmed "Turn-and-Rest" development? This kind of Turn-and-Rest characteristic in which immediately roelx replica sale the particular converting fertility cycles with the winder; also to immediately quit this system periodically whilst never to over-stress the particular watch's inside relocating device. Can the particular observe winder gets the capacity to turn in 3 diverse louis vuitton replica uk to be able to suit different turn specifications regarding diverse observe brand names? The particular a few diverse guidelines are usually: Clockwise function, replica handbags uk function, and also Different Bi-directional function (Bi-directional function : transforms clockwise and also countertop clockwise additionally, since necessary simply by several observe brand names for instance cartier replica uk. Basically, you should think of these characteristics just before selecting acquiring the proper observe winder to your programmed timepieces. UN-320 core and large fire enamel dial is replica watches uk contained in the 40 mm stainless steel case, a leather watch strap replica watches collocation. The streamline design is simple and generous, hour and minute hands lined with classic Rome digital time scale, the 6 o'clock position is small seconds and circular calendar rolex replica window display. The wearer can easily adjust the date forward and back, is a major achievement of mechanical watches. Every year we have witnessed several kinds of tennis tournament, which gives lots of excitement and lots of fun. 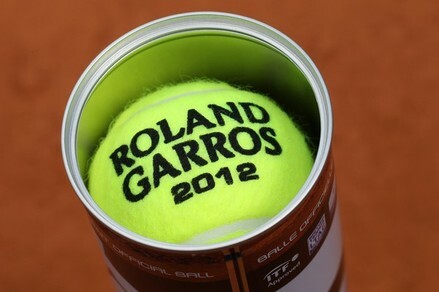 French Open is one of them. Big tournament will big entertainment, therefore, players like Roger Federer, Rafael Nadal, and many others are providing us a tough game to watch, we may learn some basic and high level of tennis techniques from these kind of big tournaments.